Three.js is a very promising tool if you want to add a third dimension to your web maps. In my last blog post, I showed how easy it was to create a WebGL Earth in the browser. Today, I'm starting a new blog series about terrain building with three.js. I will continue using map data from Jotunheimen, a mountainous area of Norway. The 29 highest mountains in Norway are all in Jotunheimen, as well as the deepest valley, Utladalen. It's a great spot for 3D terrain mapping. But the same techniques applies to all terrains, - you only need some terrain data. Instead of Leaflet, we're going to use WebGL and three.js to render the maps. Last friday, 27th September 2013, was a milestone in the mapping history of Norway. The Norwegian Mapping Authority released its topographic datasets to the public, free of charge. Included was also a digital elevation model (DEM) of the Norwegian mainland, at 10 meters resolution. You can download the data on this page (unfortunately only in Norwegian), under a CC BY 3.0 licence. 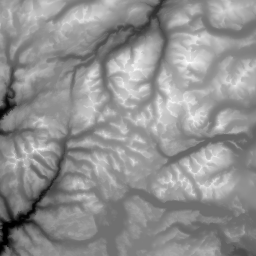 The terrain files created in this blog post are also available on GitHub. 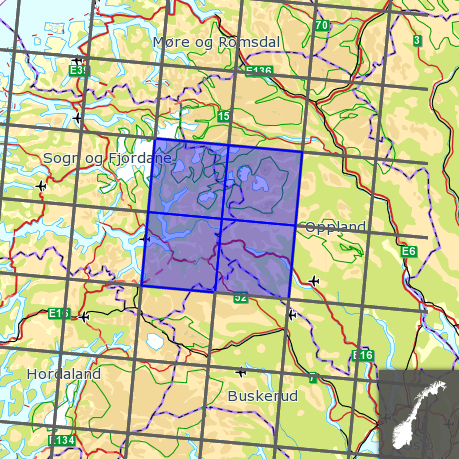 Norway is divided into 50 x 50 km tiles, and you can select the areas you want to download on a map. We need 4 tiles to cover Jotunheimen. The image or grid size is 6000 x 6000 pixels or cells. The coordinate system is UTM zone 32N using the WGS 84 spheroid. The coordinate unit is meters. Each pixel or grid cell covers an area of 10 x 10 meters. The extent of the area is defined by four coordinate pairs, covering an area of 3,600 km² (60 x 60 km). The image is single band and the elevation data is stored as 16-bit integers. The minimum elevation is 1.9 meters and the maximum is 2,467.8 meters. 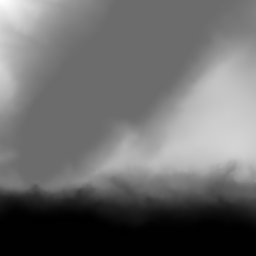 This command will create a PNG where the height values are reduced to 256 shades of gray. I'm also reducing the size from 6000 x 6000 px to only 200 x 200 px to save our GPU. Each pixel or elevation value is now covering an area of 300 meters. 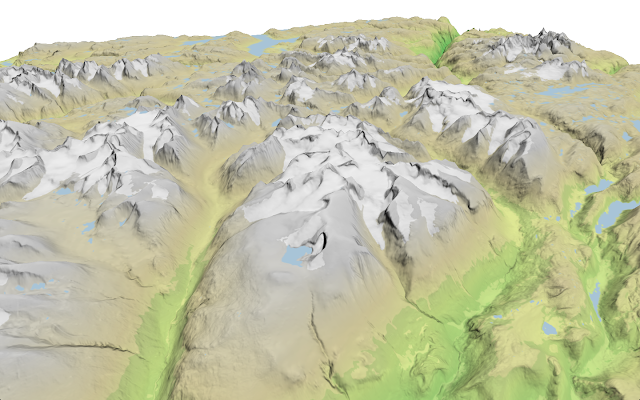 In the next blog post, we'll start playing with our terrain data in three.js. 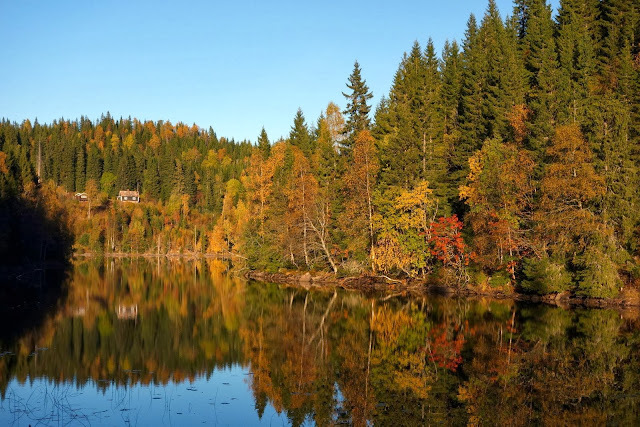 Autumn in Nordmarka in Oslo. Photo: Bjørn Sandvik, 5th October 2013. For the gdalwarp, where do your values come from for: 432000 6790000 492000 6850000? The values are described in this blog post. Are you familiar with any technique for smoothly transistioning from a two dimensional view to a three dimensional view? Consider a 2D square for example. If I push upwards on the lower most edge of the square I would like the image to transistion into a cube. If there is a 2D square and a 2D rectangle on a canvas if I push upwards on the lower edge of the canvas the image transistions into a 3D cube and 3D rectangle block. Google Earth has this similar effect. As you fly into the map the image smoothly transistions from a 2D map image to a 3D real world terrain image just as happens in real life. Any suggestions would be welcomed. Thanks. Love your work:) everything is explained in detail and final results are always astonishing. What should I do to receive the correct tiff file (just as you did)? I don`t understand were you get thee coordinates for the gdalwarp.